Having heard about this via the London City of Beer project, I dropped by there last week, along with two Danish friends who were in town. The first challenge was finding the place – it has quite a small frontage inside the railway station next to the ticket gates, and while its windows are full of interesting-looking bottles, they make it look more like a shop. 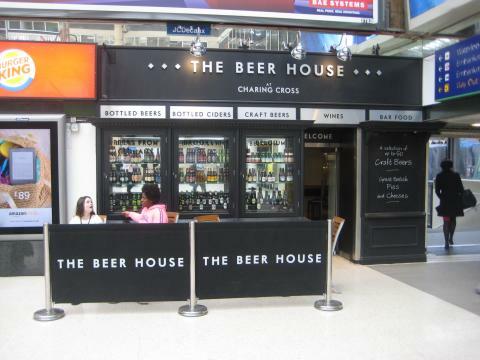 Formerly the Boadicea, it's an odd space inside, nicely done up and comfy enough, but windowless – that frontage is actually a fake – and it still has that transient feel you get from station pubs. Add over-loud music and the fact that the bar also seems to be the entrance-way to various station back-offices and storerooms, and it doesn't encourage one to linger. On top of that, while the beer's not bad, there is no real ale and quite a bit of the keg beer is not really craft. 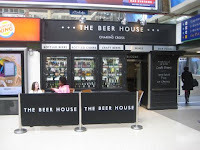 The place's operator, a company called SSP which calls itself a "food-travel operator", touts it as craft-beer focused, but on the bar are Heineken, Krombacher (Pils and Dark), Moretti and Amstel. I have some bad news for SSP's marketeers: "Foreign" does NOT equal "craft". The rest of the keg range includes Vedett, the inevitable solitary kriek for the fruit beer fans (Liefmanns, in this case), Aspalls cider, Innis & Gunn Original, and two from Meantime – the London Pale and a seasonal, which was Dunkel Weizen when we visited. All but a couple of the 15 keg beers look to be regular, the other one that may change being the single US tap, which was Brooklyn Lager last week, although the blackboard said it would be Anchor Steam. Flights of three thirds are a fiver (pints are £4.50 and upwards! ), and one or two of those would probably sate your curiosity. The bottled range is a bit more interesting, including a decent range of US ales and lagers plus unusual examples from places such as Sweden, Vietnam, Iceland and Cuba. All are pricey however – some are almost £6 for only 33cl. Also on offer is pub fare such as pies and cheese plates, the hot food is microwaved from frozen and of variable quality. PS. If you have one of SSP's Bite discount cards, you can use it at the Beer House to get 20% off both food and drink - or you could when last I tried. It means the three-thirds flights are £4 which isn't too bad for central London. Thanks for the reminder! I've been there a couple of times in the past, but not for a few years as I'm not in the Kingston area as often as I used to be. Must try to get there again some time.